From Square Enix. 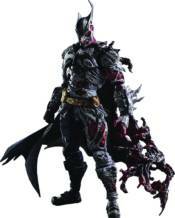 The DC Comics Variant Play Arts KAI line announces its latest collection: the Batman: Rogues Gallery series! This mashup of Batman's classic silhouette with the beloved villains of his Rogues Gallery results in a never-before-seen design collaboration, and the debut figure for this line is Two-Face. The right half of his body resembles the classic Batman design, but the armor and suit are slightly melted and warped. On the left half, however, the color scheme and form are totally transformed, resulting in a Two-Face design applied to a Batman outline. A charred, scorched paint effect has been carefully reproduced, along with eyes made with transparent parts for a haunting expression, set in a visage of half-melted flesh. The figure includes an interchangeable grinning face and hand parts, so that Two-Face can be posed doing his signature coin toss. This figure's novel design hopes to give the best of both worlds, simultaneously heads and tails, for an unlikely but delightfully evil Two-Face action figure.